Back in February of this year I received an email from Dan Shepherd of Farshoreline Productions. He said he was producing a programme for BBC Radio 4 about spoken word cut-ups and could I spare some time to talk with me over the phone. Dan called me a day or two later, and we were still talking nearly two hours later – initially he had contacted me to see if I would like to appear in the show but about halfway through the conversation he asked if I would be interested in presenting it. This offer was unexpected but extremely welcome – I had been either too sick or too busy on other projects last year to think about pitching any shows to either Radio 3 or Radio 4 over the forthcoming season. As Dan had initially been thinking of doing the show without a presenter, I would not be causing any problems for anyone by immediately saying yes. Fast forward neatly six months and you can hear the result of our collaboration at 11.30 on June 25 and then on BBC i-Player shortly after that. As well as archive recordings of William S Burroughs and Brion Gysin, together with audio cut-ups by Walter Ruttmann and Douglas Khan, we also have interviews with artists Lenka Clayton and Vicky Bennett, Burroughs biographer Marry Miles, Cold Cut’s Matt Black and DJ Food, who took us through his amazing record collection. 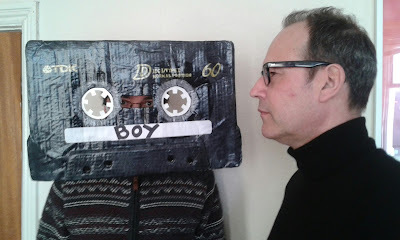 It was great to get even a small musical take on the cut-up, even though we didn’t really have the space to dwell on this much beyond sketching the connections between the spoken word, hip hop and techno. It would, for example, have been great to look more closely at the ‘cut in’ records released from the late 1950s onwards where lines and fragments of hit songs are spliced together to create nonsense narratives. I was immediately struck by the enthusiasm everyone showed for the cut-up in all its different forms – great stretches of the interviews were unusable because we were all laughing so much, but the stuff we did get was worth it. Lenka Clayton was fantastic describing how she arranged all of the words of George Bush’s ‘Axis of Evil’ speech into alphabetical order and what it told her about political rhetoric. Vicky Bennett made a compelling argument for spoken word cut-ups as a form of folk culture similar to pictorial collages. Barry Miles probably gave us the most useful definition of the cut-up as the best means of clearing a dinner party when your guests don’t show any sign of leaving. This is the kind of social advice Emily Post would never have offered her readers. Recorded in a secret location (actually his front room), Cassetteboy gave a fascinating account of how he used the transcripts of party conference speeches to create the infamous Cameron Conference Rap and extolled the excellent quality of conference recordings, which allowed every word to be heard clearly. I got the impression that given the choice between making a point and getting a laugh, he would probably choose the latter. He is definitely a problem solver – the room was stacked with board games, and he was drinking from a mug with ‘I Love Spread Sheets’ printed on it. He also has a self-effacing charm that only serves to make his satirical assaults all the more innocent and murderous at the same time. Apparently he is not looking forward to another five years of cutting up David Cameron’s speeches. Dan also managed to grab about half an hour with Armando Iannucci while he was in London finishing up post-production on the latest series of Veep. We both thought it would be a long shot getting him for the show, considering his heavy work schedule, so we were very pleased when his office made the arrangements. It turned out, however, that they must have said yes to all such requests, which meant that over the next two or three weeks Iannucci seemed to be appearing on just about everything short of the shipping forecast. He gave us a charming and brilliant interview, however, and was completely focussed on answering our questions. Dan has collected some outtakes and extra material from all of the interviews, plus some additional text from me, which we are hoping to post on the Farshoreline website sometime over the summer. Working on this programme reminded me of Burroughs’ comment that the cut-up was the friendly thing to do and that ‘any number can play’ so long as they have tape recorder to hand. His comment is entirely appropriate to an experience that seemed to be more about sharing information and insights than disrupting logical thought and storming the reality studios. That said, these are definitely some of the guys I want on my squad when the time comes.